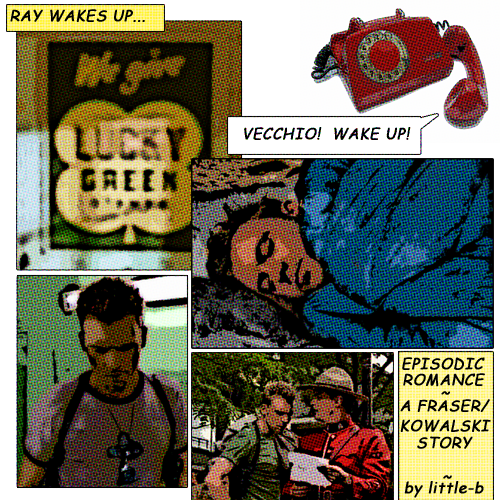 Episodic Romance, a due South adventure of the Fraser/Kowalski variety. Rated as "R" for your sanity convenience. Somewhere around 70,000 words. Film students, dead gangsters, becoming Ray Vecchio, Old Chicago, and familiar faces. Ray doesn't want to wake; he wants to drown in sleep. Sleep is cool and placid and leaches away every single thought, just as sure as the water sucked the warmth from his muscles in the Henry Allen. Ray doesn't want strong arms grasping him, or hot breath forced between his lips and into his lungs; Ray kicks and tries to wrench free. He wants to go back, dive back under, burrow under his comforter to find the serenity of the drowning. That still moment when nothing matters any more, because everything is certain and everything is a long and dreamless sleep. But the more Ray struggles, the more Ray tries to wrench free and have the current take him; the more aware Ray becomes. The more awake Ray becomes. I hope to produce a .pdf version some time in the near future, for those of you who enjoy pretty and prinatable fiction. Yeungmaisu, goddess of Red Ships Green Ships and the most patient woman on the planet. She asked for something fitting an "episode" theme. She got something of a Lady's Man tag merging into my idea of a due South episode with a crazy case, odd in-jokes and more slash. Her support was instrumental on getting this plot bunny to fly and her suggestion is why you are reading this now. Tora Kowalski, my own beta princess, kept reading and suggesting and helping me polish up my act. Shadowkitty, friend and lover of dangerous sports. She let me into her room and her heart long before I started writing this thing. What is more miraculous is that she let me stay after I started getting possessed by the spirit of Ray Kowalski and getting agressive with the furniture. Also, she wrote down everything I said that day and kept listening as this story grew and grew. Papajoemambo, my favourite Canadian, needs thanking in more ways than one. Helping me to find Canadians who weren't in due South was just one of his many good points. Also, he let me sic a load of bratty Canadian film students onto him. Isiscolo, talented writer and somebody unafarid to pull punches, was a pace-setter as we grumbled together about the joy of writing long form fanfiction. Grey and Bluebrocade, they helped me with an early-stage draft, sporked Anglicisms, and put me on the right road. My livejournal friends-list gave me more synonyms for vomiting than ever possible. Everyone over at ds_recs, especially the ones helping me dig the dirt on Chicago. Last, and not least, JS Cavalcante, the biggest fan of this project, and the most wonderful and supportive person. Not just a matter of top-notch feedback, or helping me write like a Chicago cop with experimental hair, but introduced me to Steve McQueen and helped me find the right words to end this story on. Without these fine people this boat would be sunk. Any holes in the hull are my own. Facts are as true as can be in the arms of fiction. due South belongs to Alliance Atlantis, was created by Paul Haggis and was perpetuated by Paul Gross. All other content © little-b, buzzylittleb 2004-7. Please do not archive without prior permission. Feedback should be sent here or left on the livejournal entry.